Praised as “masterful” by the New York Times and “uncommonly talented” by Publishers Weekly and winner of the 1999 Martin Luther King Jr. Achievement Award, Austin Clarke has a distinguished reputation as one of the preeminent Caribbean writers of our time. 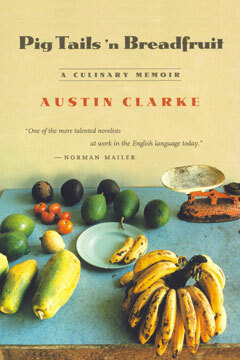 In Pig Tails ’n Breadfruit, he has created a tantalizing “culinary memoir” of his childhood in Barbados. Clarke describes how he learned traditional Bajan cooking—food with origins in the days of slavery, hardship, and economic grief—by listening to this mother, aunts, and cousins talking in the kitchen as they prepared each meal. Pig Tails ’n Breadfruit is not a recipe book; rather, each chapter is devoted to a detailed description of the ritual surrounding the preparation of a particular native dish—Oxtails with Mushrooms, Smoked Ham Hocks with Lima Beans, or Breadfruit Cou-Cou with Braising Beef. Cooking here, as in Clarke’s home, is based not on precise measurements, but on trial and error, taste and touch. As a result, the process becomes utterly sensual, and the author’s exquisite language artfully translates sense into words, creating a rich and intoxicating personal memoir.